Art from Ashes offers weekly programs for youth. Participants learn to use language to find their power to release themselves and remove barriers created by abuse, neglect, drug addiction,societal abandonment or other struggles. The programs are not therapy, but are therapeutic by providing individuals with growth in personal expression, connection and transformation. Arts from Ashes is constantly growing and adding new programs. Their latest addition to the programs is Wingspan which focuses on dance and movement and Casting Shadows which teaches drama and creative play. During a survey performed by Art from Ashes a student was quoted saying “I have creative genius in me, and people want to hear it spoken.” The programs offered by Art from Ashes do just that, by giving participants an opportunity to explore their creative side in a safe, non-judgmental space. Art from Ashes has partnered with over 25 local schools and agencies to facilitate hundreds of workshops which have impacted over 7,000 youth contacts between the ages of 12 and 24! Catherine O’Neill Thorn, Founder and Executive Director of Art from Ashes mentioned that through the growth of the organization she has seen, “beautiful artwork rise out of ashes of despair.” Applewood is thrilled to assist an organization dedicated to helping youth through creative and effective methods. 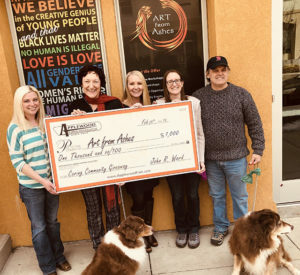 Art from Ashes will use the $1,000 to help expand their programs to touch even more lives. “We are honored to take advantage of the opportunity to support youth and the arts in our community. It’s important to us.” said John Ward, Applewood Plumbing Heating & Electric president.